A RIB like tender stows in reverse into the stern as an integral part of the overall HReko hull. 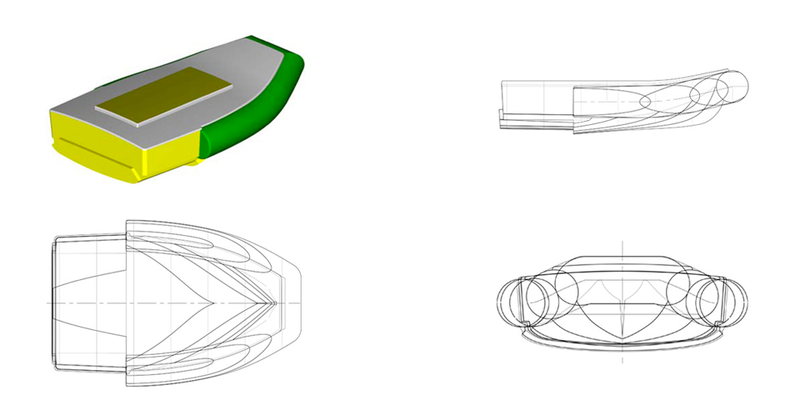 It extends the dynamic waterline considerably, allowing a 10 meter boat to have some characteristics of a 40-footer. One advantage is a gain of about 0.5 knots of maximal theoretical boat speed. When moored in a marina it serves as a stern gangway. The tender bow tube facing toward the pier can serve as a stern bumper. The tender allows use of a conventional outboard motor, and offers sailing capabilities and characteristics comparable to other smaller RIB boats. Also possible is the application of an electric jet propulsion drive with average speed of 3-4 knots. With its content of about 2000 liters of closed air, the tender adds an important component of boat safety. The tender is 3.2 meters long and 1.8 meters wide (2.2 m with tubes). Due to its very low draft, eventual breach of hull integrity due to hull damage would likely not occur until the boat is already on shore or hard aground. Extensive hull damage on open seas should also not be an immediate threat for HReko’s crew because the boat is virtually unsinkable. In addition to the tender with its 2000 liters of closed air buoyancy (600 liters in tubes) there are five buoyancy chambers and an additional 1500 liters of captive air to make the boat practically unsinkable. The buoyancy chambers, as a part of the overall stability concept, do not reduce on board space because they are situated outside the main shell. Even when completely filled with water, HReko is able to sail. A foam core sandwich construction also contributes to the positive buoyancy of the hull with approximately 1500 liters of volume.